Wolves beat United 2-1 in the quarter-finals of the FA Cup on 16 March, but Solskjaer will be wondering how they managed to throw away three points here. The visitors nearly scored within 30 seconds of the start as Jesse Lingard immediately ran at the Wolves defence and was denied by Rui Patricio. The Wolves goalkeeper also did well to keep out Romelu Lukaku's close-range header, but was powerless to stop McTominay's fine strike, although the goalkeeper then did make an excellent save to deny Lingard. United's lead was well-deserved, but from then on they self-destructed. Wolves' equaliser came after Fred was caught in possession 30 yards from his own goal after a pass out from De Gea, before Young was sent off for a reckless sliding challenge when he was already on a booking, catching Jota halfway up his shin. 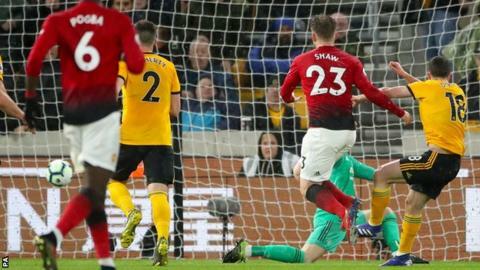 Solskjaer will also be furious with Wolves' winning goal as there seemed to be little danger when Jimenez challenged Phil Jones for a header, but De Gea could not collect the ball cleanly, with it then bouncing off Smalling and creeping over the line. For Wolves, it was another excellent result in a wonderful season for them as they close in on their best league finish since coming sixth in 1979-80 and also have an FA Cup semi-final to look forward to against Watford at Wembley on Sunday. After going behind to McTominay's goal, Wolves boss Nuno Espirito Santo will be delighted with how his side responded as they enjoyed a bright spell midway through the first half with Jimenez shooting wide before he linked up well with the impressive Jota, who made it 1-1. Patricio kept Wolves in it with another fine save early in the second half, keeping out a McTominay header after Paul Pogba had glanced on Lukaku's cross, before Nuno's side, who only had two shots on goal, scored their second in the 77th minute - albeit with a touch of fortune. Wolves nearly added a third in injury-time when Ivan Cavaleiro out-paced Victor Lindelof, but saw his well-struck effort bounce off the crossbar. The win keeps Wolves in seventh place in their first season back in the top flight after winning the Championship in 2017-18. Only two sides in the past eight years have finished in the top 10 in their first season since winning promotion to the Premier League - West Ham (10th in 2012-13) and Newcastle (10th in 2017-18). Wolves are also aiming to become the first newly-promoted side to finish in the top eight since Reading finished eighth in 2005-06, while no newly-promoted team has finished higher than that since Ipswich Town came fifth in 2000-01. Wolves have won more points against 'big six' sides in the Premier League this season than any of the other 14 teams in the competition (13 - won three, drew four, lost three). Manchester United have failed to win home or away against a promoted side in a single Premier League campaign for the first time since 2002-03 vs Man City. United have lost consecutive away games against Wolves in all competitions for the first time since August 1980. Following Ashley Young's dismissal, Mike Dean has now handed out 100 red cards in the Premier League, the most by a referee in the competition's history. Both of Young's red cards in the competition have been shown by Dean (January 2009 for Aston Villa versus Sunderland was the other). United have had more goalscorers (excluding own-goals) than any other Premier League team this season (16). Raul Jimenez has been directly involved in 19 Premier League goals this season (12 goals, 7 assists) - five more than any Wolves player has registered in a single season in the competition. Wolves manager Nuno Espirito Santo speaking to BBC's Match of the Day: "It was a good night, a good game of football. "What more can you ask? We know it was very difficult. The extra effort the boys had to make and how they react to the first goal - I'm really pleased. "I give credit to United for how they shaped themselves, it was difficult to recover the ball. "The preparation starts now for the [FA Cup] semi-final - we will rest and prepare for a difficult game. A fantastic challenge for us." Manchester United boss Ole Gunnar Solskjaer speaking to BBC's Match of the Day: "We played some fantastic stuff, first 20 minutes we should have been two or three up and I'm not exaggerating, but we didn't pounce on big moments in the game. "Scott McTominay played really well tonight, he's been excellent. He gave us a goal threat, energy and legs - I'm very pleased with him. "There were a couple of mistakes from us. We gave them that first goal, we have to be honest." "With 10 men it's hard but we had to keep the ball. We didn't want them to put pressure on us. They scored with their first chance after the sending off and you have to give them credit for that. "I'm very disappointed with the result but pleased with the performance up until 75 minutes - it was an excellent performance from the boys." United need to quickly regroup as they play Barcelona in the first leg of their Champions League quarter-final tie at Old Trafford on 10 April. They are next in league action on 13 April - at home against West Ham, but will be without Young and fellow defender Luke Shaw after his first-half booking was his 10th of the season, meaning he will serve a two-game domestic ban. Wolves' next match is their FA Cup semi-final against Watford at Wembley on 7 April and they return to league action on 13 April, away at Southampton. Offside, Manchester United. Jesse Lingard tries a through ball, but Paul Pogba is caught offside. Corner, Manchester United. Conceded by Leander Dendoncker. Ivan Cavaleiro (Wolverhampton Wanderers) hits the bar with a left footed shot from the centre of the box. Assisted by Raúl Jiménez following a fast break. Corner, Wolverhampton Wanderers. Conceded by David de Gea. Attempt missed. Paul Pogba (Manchester United) left footed shot from outside the box misses to the right. Assisted by Anthony Martial. Substitution, Manchester United. Andreas Pereira replaces Diogo Dalot. Substitution, Wolverhampton Wanderers. Romain Saïss replaces Rúben Neves. Attempt blocked. Scott McTominay (Manchester United) right footed shot from outside the box is blocked. Assisted by Anthony Martial. Own Goal by Chris Smalling, Manchester United. Wolverhampton Wanderers 2, Manchester United 1. Attempt blocked. Raúl Jiménez (Wolverhampton Wanderers) header from very close range is blocked. Assisted by João Moutinho with a cross. Substitution, Wolverhampton Wanderers. Jonny replaces Rúben Vinagre. Attempt missed. Scott McTominay (Manchester United) header from very close range is too high. Assisted by Diogo Dalot with a cross following a corner. Attempt blocked. Luke Shaw (Manchester United) right footed shot from outside the box is blocked. Attempt missed. Phil Jones (Manchester United) right footed shot from outside the box misses to the left following a corner. Corner, Manchester United. Conceded by Rúben Vinagre. Substitution, Manchester United. Phil Jones replaces Fred. Attempt blocked. Luke Shaw (Manchester United) right footed shot from the left side of the box is blocked. Assisted by Paul Pogba. Second yellow card to Ashley Young (Manchester United) for a bad foul. Attempt saved. Scott McTominay (Manchester United) header from the centre of the box is saved in the centre of the goal. Assisted by Paul Pogba with a headed pass. Offside, Wolverhampton Wanderers. Conor Coady tries a through ball, but Rúben Vinagre is caught offside.